Front Row – Averi Glick, Shelby York, Ashlynn Yarletts and Makenzi Moore, Back Row – Sophie Sloneker, Tabi Larison, Katie Sloneker, Maddy Wehry and Ashley McNabb Not Pictured – Aubri Jones. This past summer Edgewood High School hosted the Butler County Girls Basketball Summer League. The league was divided into two different grade levels: a 4th/5th grade division and a 6th/7th grade division. 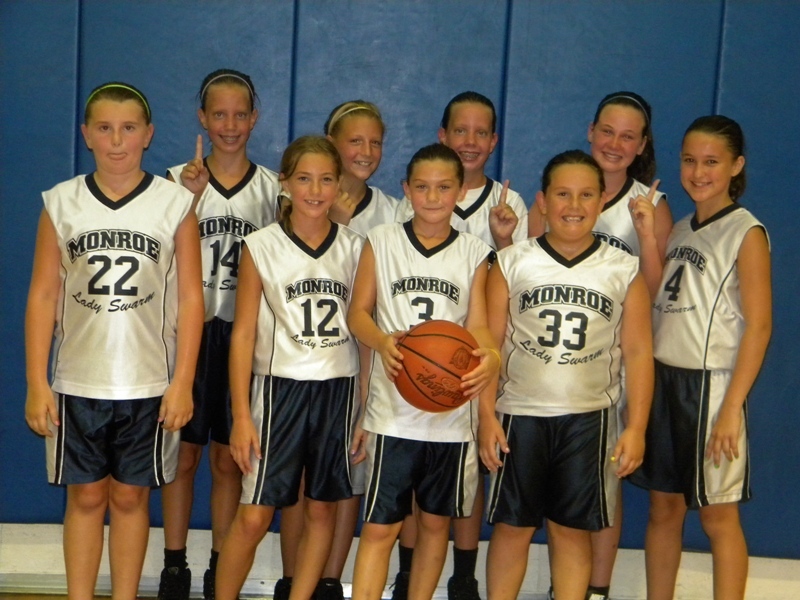 Monroe was the 4th/5th grade league champs and post-season tournament champs! The team was undefeated at 8-0. Participating teams included: 4th/5th grade Middletown, 4th grade Edgewood, 5th grade Edgewood, 5th grade Hamilton, 5th grade Eaton and two 4th/5th grade Badin teams . Our team was made up of three 5th graders and seven 4th graders. Fourth grade team members were: Averi Glick, Aubri Jones, Makenzi Moore, Katie Sloneker, Sophie Sloneker, Ashlynn Yarletts and Shelby York. Fifth grade players: Tabi Larison, Ashley McNabb and Maddy Wehry.